When that Personal Touch is Needed. 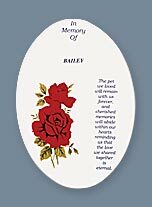 Our personalized Pet Memorial Plaques have been enthusiastically endorsed by veterinarians and their staffs across United States and Canada. Beautifully crafted, these 4x6 Ceramic ovals serve as a loving reminder of a lost loved one. When sending to someone as a rembrance of their pet, we will enclose a sympathy card with a brief message from you. "In 40 years of practice, nothing has been as well received as your Pet Memorial Plaques"
Have a loving, lasting impression of your Pet. Its never been easier to make and keep a lasting memory of your Pet. INTRODUCTORY OFFER: Free Shipping on First Order and Special Pricing! Four inches round and trimmed in gold, these Bone White Miniture Plates were custom designed for CSS. 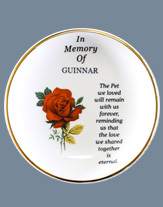 Personalized with the pets name, and the added touch of gold, makes our new Mini Pet Remembrance Plate that special memory of a lost loved one. 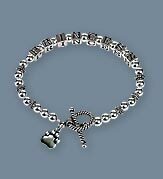 You will adore our personalized Sterling Silver Pet Lovers Bracelet created exclusively for CSS. Use this as a unique gift for friends, family, or just yourself. Our Pet Lovers Bracelet is a beautiful adornment to wear and keep your beloved pet close to you wherever you go. Our single strand, 8 block bracelet features the Toggled clasp design and is 7 inches long. Additional blocks, strands, and sizes are available at additional charge. Maximum 14 blocks per strand, and maximum 4 strands per bracelet. 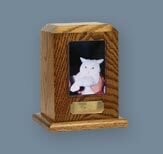 How about a solid wooden light or dark frame with a pet memorial plaque? These frames are made of the finest real wood available and finished with a clear coat to give the wood a glossy sheen. 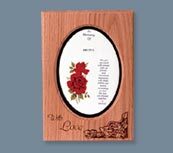 The Personal Touch is given with a beautifully designed "With Love" lasered into the frame. 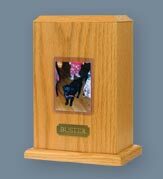 Our solid wood frames have a ready-made space for the personalized Pet Memorial Plaque. Both the single and double frames are freestanding or they may be hung on the wall. Our Wooden Urns are solid oak with a clear or dark stain finish. Each urn is loaded from the bottom and is secured by four screws. The small urn is 4'' x 4'' x 6'' high and holds 48 cubic inches. This size is ideal for a cat or small dog. 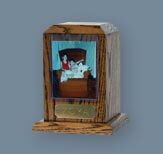 The Wooden Urns can be ordered Plain, with a Plastic Photo insert, or with a Photo insert and a Personalized Name Plate. 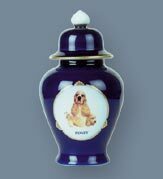 The medium urn is 5'' x 5'' x7'' high and holds 76 cubic inches; perfect for a medium sized dog. The large urn is 4'' x 6.5'' x 10'' high and holds 149 cubic inches. This size will hold any large dog or similar animal. Our Ceramic Urn comes in your choice of Blue, Green or Burgundy. We have a selection of 80 Dog's* to choose from and can be personalized. These 2 1/2 x 3 inch Magnets are available in over 80 varieties of Dogs*. Our magnet is perfect for your fridge or as a gift for a friend. 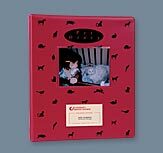 The diary comes complete with: first veterinarian visit, health record, immunization record, pet notes, suggestions for filling the diary and two clear plastic inserts to keep the license, registration, ribbons and photos. The two clear plastic inserts on the cover, are for your favorite pet photo and for your veterinarian"s business card. 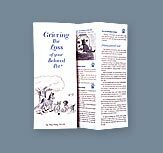 A personal account of the grieving process which is easy to read, informative, helpful and a practical approach to a difficult subject.